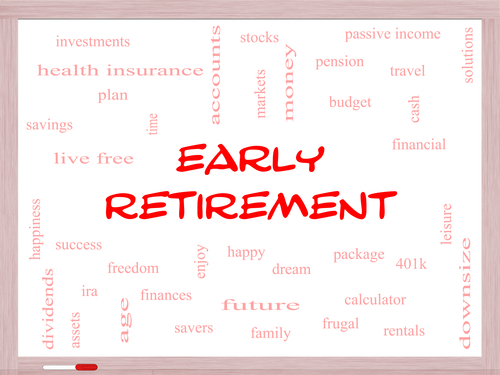 Early retirement is a dream for many people who wish to start enjoying the fruits of their labor early. However, there are times when people are forced into retirement earlier than they expected. You never really have an idea of what will happen in the future. You can make plans for your retirement but there will be times when that plan will be thrown out the window. Retirement planning is a crucial part of your finances but like with anything in life, unexpected things can happen. These can put you in situations where you would have seriously reconsider your plans and make drastic decisions. Planning for retirement is not spared because there are a number of reasons why you would encounter problems with it. Why would you consider early retirement? You might choose to retire early if you have built up enough for what you need for your golden years. It is possible that you saved from your first paycheck to being aggressive in contributing to your retirement year on year. This could have given you the nest egg necessary for retirement use. This is one of the best reasons why you would consider retiring early. However, some people are forced into it for a number of reasons. You have to understand that you get sick because you either did not take care of yourself or it is already in your genes. If you are forced into early retirement because of health issues, this can be a big deal. You could have been in an accident and forced to retire because you are unable to continue the type of work that you do. Another is that you could have a serious illness where the doctors prohibit you from going back to work. There are many types of critical illness where it impairs your ability to resume work. Your body can weaken or your employer might even ask you to retire early just to make sure you do not overexert yourself at work. There will be times when retiring early has a lot to do with the company you work for or the industry you are involved in. Think of what happened with companies that were not able to evolve and change with the times. Take a look at how printed medium like newspapers and magazines are in a decline now because of technology. Technology can help your finances but it can also disrupt several industries. You might be looking at early retirement if you are involved in this industry simply because demand has shifted to digital consumption. There are not a lot of people who would read newspapers or buy magazines when they can read them online. The convenience of the digital age has lowered the demand for the print industry. Now that you have an idea why you might be forced to retire early, there are a few things you can do now to help make that transition as smooth as possible. One of the best decisions you can make now to help you with early retirement is living a healthy lifestyle. The healthier you are, the lower the chances you need to retire for health reasons. Though some illnesses are already in your genes, you can manage them with a healthy state of mind and body. This is challenging at first but not an impossible task. One thing you need to consider is looking for an exercise routine you can stick to. Take a look at some of the things you love to do and build an exercise routine around it. Do you love to walk or jog? You can do that every morning to help you get some exercise. If you know how to swim or ride a bike, you can also use that to improve your health. When you are forced into early retirement, carefully assess your situation and study all your options for work. There might be something you can do to help you work for a longer time. Explore the idea of working part-time or taking in fewer hours at work to help you get a steady stream of income into your budget. If you cannot go back to your old job, try to identify other sources of income. If you have time at home, look for online jobs you pick up for a few hours a day. This can help you stay at home and you do not even have to spend as much compared to when you were working in an office. You do not have to worry about buying new clothes or even driving to and from your place of work. Of course, it is not always possible to pick up a job when you are faced with serious situations. You could have lost parts of your body or even having to deal with grief for losing someone dear to you. It is not always easy to pick-up where you left off. One thing you also have to consider is your age. If you are already nearing your retirement, it might be more challenging to look for a new source of income. In times like these, you have to take a moment and re-evaluate your retirement savings. Take a look at where you are at the moment. Check how much you have saved up to this point. You need to factor everything in from a savings account you have in the bank to 401k and IRA and even your investment accounts. This is important if you are forced into early retirement. Then look at where you need to be with your fund at retirement. What is your target goal and age? The difference between the two is what you need to work on. Can you sell some assets to fund your retirement? You can consider moving into a smaller house and sell the one you are in. The money you get from that sale can be a big push for your nest egg. CNBC also shares that if you wait until you are 70 to claim Social Security, you can get 132% of your benefit monthly. Based on how much you need to save up for retirement, you might need to start considering making drastic changes with your expenses. For one, you might want to look at cutting some subscriptions especially the ones you are no longer using. If you are used to ordering your meals, it might be time to start preparing and cooking your own. Transportation might also be something you can cut down on especially if you are no longer reporting to the office. If you have two cars, you might want to cut it down to one. Using one vehicle for the whole family might doable especially if you are no longer working. It is just a matter of coordinating schedules ahead of time to avoid confusion. There are a number of reasons why you might be forced into early retirement and the best thing to do is prepare for it. Save as much as you can while you can and if you get to that point where you had to retire early, manage your spending wisely. This will help you stretch your money in retirement.